A few weeks ago Sara and I decided it was time to make our summer even more amazing and add a monogram swap to it! We were joined by 14 other ladies, and we had a blast swapping and getting to know everyone! My swap partner was Emily from Blue Dog Belle. Emily and I have been blog friends for quite some time, so I was so excited to partner with her for the swap. 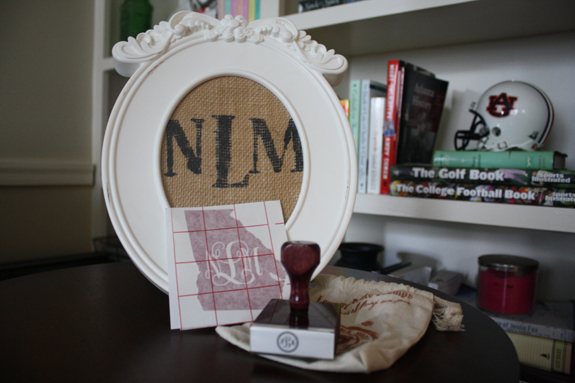 Emily sent me not one, not two, but three super cute monogrammed items that I have already put to good use! I absolutely love the frame of my new (married!) monogram. She also included a fabulous stamp for me to make my mark on every piece of mail or notepad within reach. And perhaps my favorite item she sent me was a vinyl sticker with the great state of Georgia AND my monogram. I have big plans for this one: taking a plain Jane Tervis Tumbler and turning it into something fabulous! Be sure to scoot over to Emily's blog to see what I gifted her, and show some of the other swap ladies some love and visit their blogs, too! Thank you so much to everyone who participated! We hope you enjoyed swapping! This is adorable! So sad I never got my act together to sign up for the swap!